Stretching is one of those things we all know we should do right? P.E teachers across the land drilled into us from an early age that we should at least give it a half arsed attempt before and after exercise. Stretching in a warm up increases the amount of synovial fluid in your joints, this is the body’s lubricant, it’s WD40 or Durex Play improving your range of motion and making everything nice and loose. On a cool down they help restore muscles back to their normal shape. Short inflexible muscles are also more likely to tear. For us runners, this means more strains and sprains. You’ve probably all heard of ‘runner’s knee’. Basically because running works the muscles on the outside of leg more than the inside, the muscles get stronger and pull the knee cap over to one side. Stretching the I.T band (the really long ligament that runs down the outside of the leg) can help prevent this as the muscles stay stretchy. There is no maximum limit to flexibility training so the more the better. However, as the saying goes, there is more than one way to skin a cat. There is more than one way to stretch. This is typically used for rehabilitation. It can target muscles groups as well as improve flexibility. It focuses on the nerve receptors in the muscles to extend length. First a relaxed muscle is stretched by an external force (ie a partner), you then contract the stretched muscle for 5/6 secs whilst all movement is inhibited. Then the muscle is gently pushed further past its range of movement for a further 30 seconds. Allow 30 secs for recovery before repeating 4 times. 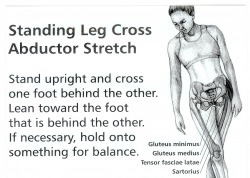 If you are injured then the force used to push the stretch must be adjusted accordingly. The idea is that all the contracting shenanigans should help the nerves that make the muscle ping back like an elastic band chill out so you can stretch further. This is a type of static stretch where an external force; such as gravity, a partner or resistance bands acts on the body to move it into a new position. The more force exerted the quicker the stretch will develop but the greater the risk of injury. If you’ve ever walked past a group of athletes in dodgy poses then chances are this is what they are doing, unless they were surrounded by beer bottles. Then it probably was something else. with coaches and NGBs (Sports National Governing Bodies) at the moment because of this. However I have one issue with using dynamic stretching in place of static for a warm up. You don’t actually stretch anything properly. Have you ever done a heel flick and thought, ‘yeah that hit the spot, I really felt that in my quads’? Those open gates really got my groin…… hmmm I think not. They are certainly not going to increase my flexibility. If you visit a Gymnastics club they certainly aren’t getting super bendy by using dynamic stretching. Stretching the muscle whilst the body is at rest. This is the old school stretching that you guys are probably all used to. The idea is to stretch to the point of mild discomfort and hold for between 10-30 seconds. During the hold you should feel a mild discomfort but this should lessen as the stretch is held. Static stretching lessens the sensitivity of the tension receptors which allow the muscles to be stretched to a greater length. 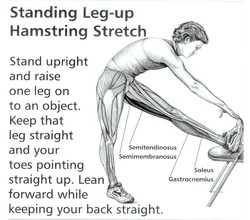 It is one of the safest forms of stretching as the movements are slow, controlled and within a normal range of motion. A Few Stretches For Runners. 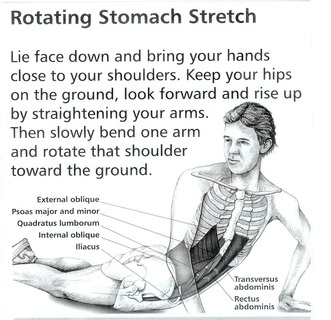 Rotating Stomach Stretch – psoas major & minor, rectus abdominis, transverse abdominis, obliques, illiacus. 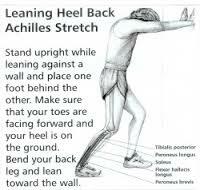 Leaning Heel Back Achilles Stretch – Tibialis Posteria, Soleus, Flexor hallucis longus, Peroneus Longus, Peroneus brevis. 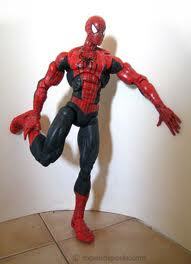 Standing Leg Up Hamstring Stretch – Semitendinosus, Semimembranosus, Biceps femoris, Gastrocnemius, Soleus. Standing Quadricep Stretch – psoas major, lliacus, Rectus femoris, Vastus lateralis, Vastus medialis, Vastus intermedius. This entry was posted in anatomy, fitness, health, running, Sports, training and tagged Dynamic stretching, Fibularis longus, fitness, Flexor hallucis longus muscle, injury prevention, newbie runner, passive stretching, Physical exercise, pnf stretching, Quadriceps femoris muscle, run, runner, runner's knee, running, Sports, sports injuries, Static stretching, stretch, Stretching, stretching for runners, Tensor fasciae latae muscle, Vastus intermedius muscle, Vastus medialis. Bookmark the permalink. Great post! I found that while there are some basic “runner’s stretches”, it does tend to get very individual at some point, and we find out which bits we need to stretch. I eventually bought a wonderful anatomy bible and refer to it often to find my next contortion move! There are some great ‘stretching bibles’ out there. I’ve got The Anatomy of Stretching by Brad Walker which sorts them by sport and injury.